Adjust oven racks to upper & lower -middle positions & heat oven to 325. 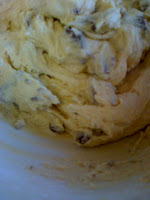 Whisk dry ingredients together; set aside.With electric mixer, or by hand, mix butter & sugars until thoroughly combined. Beat in egg, yolk and vanilla until combined. Add dry ingredients & beat at low speed just until combined. Stir in chips. Roll scant 1/2 cup dough into ball. Holding dough ball in fingertips of both hands, pull into 2 equal halves. 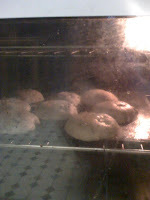 Rotate halves 90 degrees and, with jagged surfaces facing up, place formed dough onto cookie sheet, leaving ample room between each ball.-Bake, reversing position of cookie sheets halfway through baking, until cookies are light golden brown and outer edges start to harden yet centers are still soft & puffy. *This took about 14 minutes in MY oven but start at 10 minutes and check from there. Do NOT overbake! Yummy!! And your blog looks great!! You know, you really can't go wrong with ANY chocolate chip cookies. I love them cakey, crispy, chewy, chocolatey, etc. They're simply the best! For your first time they came out really good, it could be a lot worse! 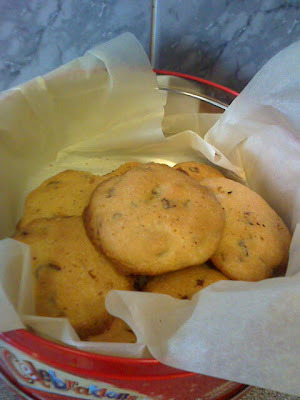 Nestle Tollhouse chocolate chip cookie recipe is a really good one. I've been making them since I was old enought to reach the countertop. 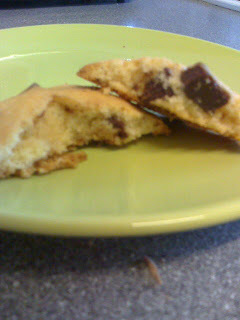 It is a no fail and I have used all different brands of chocolate chips with it! HI Nelly - It's "imstuffed" from bakespace. I didn't know you had a blog!!! way cool. Your cookie-cakes look good. would love a couple with my coffee this morning, thats for sure.